Doordarshan and National Mission for Clean Ganga bring to the school children of India, the Meri Ganga Quiz Contest. 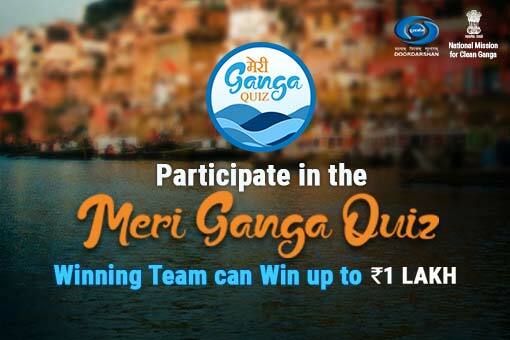 Aimed at increasing awareness about the Ganges and augmenting students’ participation in Namami Gange Mission, this Preliminary Online Round of the quiz will identify 4 teams each from 6 administrative zones of India to participate in the quarterfinals, semifinals and Grand Finale of Meri Ganga Quiz Series on DD National (In Delhi). There will be prize money of Rs. 1 Lakh for the winning team of the Grand Finale, Rs. 50, 000 for the 1st runner up of the Grand Finale and 25, 000 for the 2nd runner up of the Grand Finale. The travel and accommodation of the identified top scorers, who qualify to the quarterfinals will be borne by Doordarshan. The Preliminary Online Meri Ganga Quiz is being organized by Doordarshan and National Mission for Clean Ganga in collaboration with MyGov. The quiz shall open on 29th July 2018, 9:00 am (IST) and will close at 11:59 pm (IST) on 7th August 2018. The contest is open to all Indian school students studying in classes 8th to 12thand residing in India. School students pan India, both from government & private schools can participate in the Quiz. You can participate in the contest by registering on the MyGov platform and participating in the Meri Ganga Quiz. You are requested to update your name, email address, telephone number and postal address in your MyGov profile. By submitting your contact details you will give consent to these details being used for the purposes of the Quiz for further communication. For participating in the Quiz, the participant needs to furnish details such as name, class, e-mail id, mobile number and school name (with pin code). Entries with incomplete profile and information would not be considered. One entry will comprise two students participants (both from same school), who will take up the quiz as a team representing their respective school. One entrant can participate only once. Multiple entries from the same entrant will not be considered and will be discarded. Organizers will not accept any responsibility for entries that are lost, are late, are incomplete or have not been transmitted due to computer error or any other error beyond the organizer’s reasonable control. Please note proof of submission of the entry is not proof of receipt of the same. The top scorers from this preliminary online contest will be contacted by Doordarshan for participating in the Meri Ganga Quiz to be recorded in Delhi for telecast on DD National Channel. If a top scoring entry is not contactable within three working days from the result announcement, he or she will lose the opportunity and another top scoring entry will be selected from the remaining eligible entries in accordance with the above process until a top scoring entry is selected and can be contacted for next level participation. In the event of multiple participants scoring full marks, the top scorer will be decided based on the time taken to complete the quiz. In the event of unforeseen circumstances, organizers reserve the right to amend or withdraw the Quiz at any time. This includes the right to amend these terms and conditions. By entering the Quiz the, Entrant accepts and agrees to be bound by these Terms and Conditions. The Participant shall abide by all the rules and regulations of participating in the Quiz. MyGov holds the right to disqualify participation of any user for any misconduct or improprieties. MyGov’s decision on the Quiz shall be final and binding and no correspondence will be entertained regarding the same.